More Endurance, Greater Strength Gains, Less Exhaustion: Alpha-Keto Acids (KIC, AKG...) - Overlooked Ergogenics? As a seasoned SuppVersity veteran, you will be aware that the number of supplements that work is pretty small. The number of supplements that will actually make a difference that's not just statistically significant can probably even be counted on the fingers of one hand and arginine-alpha-ketoglutarate, aka AAKG, the purported nitric oxide booster is certainly not one of them and that despite the fact that there are one or two studies, which showed minuscule performance improvement from large doses of this combination of arginine and the alpha-keto acid to glutamine alpha-ketoglutarate. Against that background it is however even more intriguing that a group of scientists from the Section of Sports and Rehabilitation Medicine, Department of Internal Medicine II at the University of Ulm in Germany and a colleague from China report in a soon to be published paper in the Journal of the International Society of Sport Nutrition (JISSSN)that AKG, as in "AAKG minus arginine", and even more so its cousins KIC, KIV and KMV, the alpha-keto acids to the BCAA (thus BCKAs) are pretty potent ergogenics. five times a week under professional supervision. The training was carefully documented, training times recorded and rest-stress-questionnaire-sport (RESTQ; cf. Kellmann. 2001) questionnaires had to be filled at the end of every training week. Note: Since KAS are meant to buffer ammonia build-up while sodium bicarbonate, aka baking soda will buffer blood pH (and inhibit the formation of lactic acid), they would stack well (click here to read more about baking soda and the latest study about the beneficial effects of baking soda on high volume leg days)! Just as the researchers had assumed, the relatively small amounts supplemental α-keto acid (KAS), of which the scientists expected that they would reduce the exercise induced hyperammonemia (=accumulation of ammonia, a breakdown product from the oxidation of amino acids in the blood) Banister and Wilkinson held (at least partly) responsible for the fatiguing effect of longer lasting high intensity exercise (Banister. 1990; Wilkinson. 2010). Unfortunately, the scientists don't make it 100% clear what the "training time" they measured was, but I hope that you would agree that it is sensible to assume that this refers to the timespan during each workout at which the subjects actually reached the prescribed target heart rates, i.e. the anaerobic threshold for the endurance part and 95%+ of their individual HRmax for the sprints. In order to make the data more legible and thus easier to understand I did therefore express the figures the scientists measured relative to the maximal time the participants could have been performing at the target heart rates, i.e. 5 x 30min (150min running) and 5 x 3 x 3min (45 min sprinting) per week, in the endurance and sprint part of their five weekly sessions, respectively. Based on the plot of these calculations (figure 1), you can easily see that the provision of the keto acids of the BCAAs, i.e. 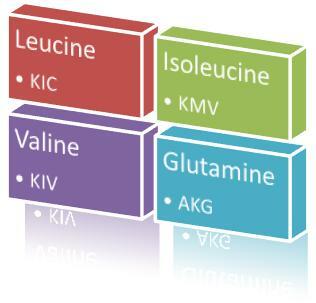 KIC, KMV & KIV, the BCKAs, were more effective than the keto acid of glutamine (AKG) in buffering the cumulative performance decrements that occurred from week 1-4. These findings are corroborated by both, the results of the weekly RESTQ questionnaires, i.e. The gains in endurance capacity, on the other hand, did not differ between the groups. Remember: Ergogenics allow you to work harder - in other words, you got to do more, not less! Overall the data does still support something people tend to overlook and supplement manufacturers and vendors like to disguise: Ergogenics don't build muscle, strength or make you run faster over night. Regardless of the exact mechanism by which those compounds work, it in the end always the increase in training intensity and/or volume (or your ability to increase the latter faster without running the risk of overtraining), which will eventually help you to make greater or faster progress - or as the subheading says: You got to work harder / more - not less! Bottom line: The study is nice, the results are impressive, but the study population (untrained individuals) and their diets (low protein, low fat variety of SAD diet + a beer every evening *hello? *) don't really allow for conclusions to be drawn as far as the effects of keto acids, i.e. the effects of both AKG, as well as the BCKAs, on trained athletes / seasoned gymrats with adequate protein intakes on reasonable training regimen is concerned. To cut a long story short, I would not go and buy any of those keto acids before we don't have at least a single independent, peer-reviewed study that would confirm their efficiacy in a group of trainees who are at least experienced recreational athletes. It would obviously be even better to see those trainees supplement with KAS on top of a protein shake, creatine and maybe BCAAs while they eat a protein rich, nutritionally balanced whole-foods diet (like you? ), but let's be honest, I don't think we will see a study like that anytime soon, ... but in case we do, you know where you are going to read about the results first, right? Banister EW, Cameron BJ: Exercise-induced hyperammonemia: peripheral and central effects. Int J Sports Med 1990, 11(Suppl 2):S129–S142. Liu Y, Lange R, Langanky J, Hamma T, Yang B, Steinacker JM. Improved training tolerance by supplementation with alpha-Keto acids in untrained young adults: a randomized, double blind, placebo-controlled trial. J Int Soc Sports Nutr. 2012 Aug 2;9(1):37.
revisiting the link. Prog Neurobiol 2010, 91:200–219.